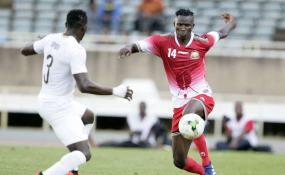 Striker Michael Olunga is out of contention for a place in Harambee Stars’ final squad for the 2019 Africa Cup of Nations qualifier away to the Black Stars of Ghana. The 24-year-old, who features for Japan second tier outfit Kashiwa Reysol, picked a hamstring injury during their 1-0 win against Albirex Niigata in a league match on Saturday. Olunga, who has 17 goals in 34 appearances for Kenya, scored the all-important goal in the match. In his place, Zesco United hitman, who had been snubbed from the provisional squad, has been summoned by head coach Sebastien Migne. Jesse was last called up when Kenya played Ghana September last year. He didn't feature in the game but started in the 1-0 friendly win against Malawi two days later albeit for the first 45 minutes before paving way for Pistone Mutamba of Sofapaka. Were has struggled to find the back of the net in Stars jersey despite enjoying great form in Zambia. The team reports to camp on Sunday with the foreign-based legion expected to link up with the rest from Tuesday. Both Kenya and Ghana have already qualified for the continental showpiece that goes down in Egypt in June.